This post is the first in what will be an occasional series. This site already contains a large number of documents produced by Big Flame or its members. Most can be found in the 30 posts in Episodes in Big Flame History. Each post contains links to documents which relate to its theme. Links to the same documents are also listed on the website’s Publications page, this time sorted by type – pamphlets, journals, newspaper, internal documents. The first document is “How To Fight Them” from early 1971. It took the form of a two sided broadsheet, slightly larger than A2. It was published between the demise of first Merseyside newspaper called Big Flame (produced by a coalition of those on the left) in October 1970 and the relaunch of the new Big Flame (produced by a new group of the same name) in June 1972. See the post on The Beginning in the “Episodes in Big Flame History” series. The first side of the broadsheet “How To Fight Them” focuses on how to fight bosses in the workplace. The second “How Not To Fight Them” looks at the Government’s Industrial Relations Bill and the response of the trade unions and the Labour party. There is no date given in the broadsheet, but it contains lots of clues. The Industrial Relations Bill, was first presented to Parliament on the 1st December 1970, with the Act becoming operative on the 5th August 1971. There is a mention of it being “5 months” since the Bill came out, suggesting the broadsheet was produced in April 1971. This date fits well with the mentions of the power and postal worker strikes as recent defeats (they happened between Dec 1970 and Feb 1971). 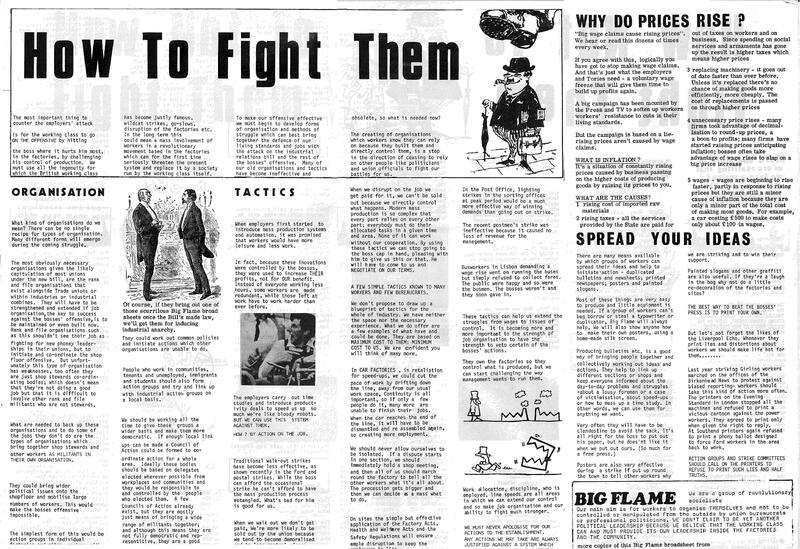 What makes “How to Fight Them” particularly interesting is that it is the clearest statement of Big Flame’s general perspectives before the publication in 1977 of the Draft Manifesto for a proposed new organisation Towards a New Revolutionary Socialist Organisation. See the post on The Project and Socialist Unity. – An emphasis on workers’ self organisation. – The advocacy of forms of industrial action which raise issues of control. – An understanding of trade union leaders which seems the problem as one of the system rather than with individuals. – A suspicion of left groups which proclaim themselves the leadership of the working class. – The focus is almost entirely on workplace struggles with only a couple of passing references to struggles in the community, and no mention of women. – The perspective for what is happening in the workplace seems the world almost exclusively in terms of mass assembly production lines. – Whilst the need to involve rank and file militants is stressed there are no criticisms of shop stewards. Soon after the broadsheet was published Big Flame adopted a critical line on shop stewards, strongly influenced by events at Ford Halewood. Later on, this position was also modified. See the post on Industry and Workplace. – The desirability of a “revolutionary movement” is mentioned, although there is little clue of what this might entail apart from possibly a coming together of “Councils of Action”. The form of organisation required by the working class to achieve a transition to socialism was the subject of further debate in BF over they years. See the post on Party and Class. Because of the size of the broadsheet it was not possible to do a normal scan of it. So I’ve cut and pasted the text into an A4 document, keeping the original graphics. Click here to read: How To Fight Them. Update (31/8/2010): A new version of the attached document How to Fight Them has been uploaded which corrects the small gaps of missing text in the previous version.